Well intrepid reader, it is time to close out this season. It's getting cold, the days are getting shorter, and the fresh water is about to become hard. I needed to have a definite end date to this sailing season, mostly because if I didn't, I'd keep sailing into the early reaches of winter, and I'm sure something would happen that I would regret. Additionally, the Goat Island Skiff needs some attention, she deserves a de-salting and a rest while the temperatures are still above freezing. 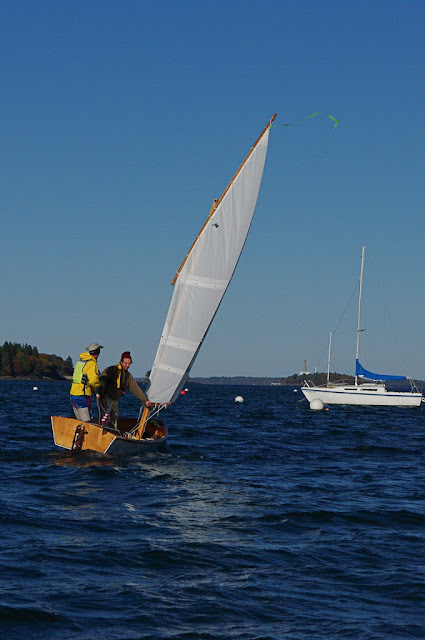 Saturday was the last day, in Portland, in conjunction with Clint Chase Boatbuilder's annual boat-talk and small messabout at the East End. I am relying on others who took pictures and the video. 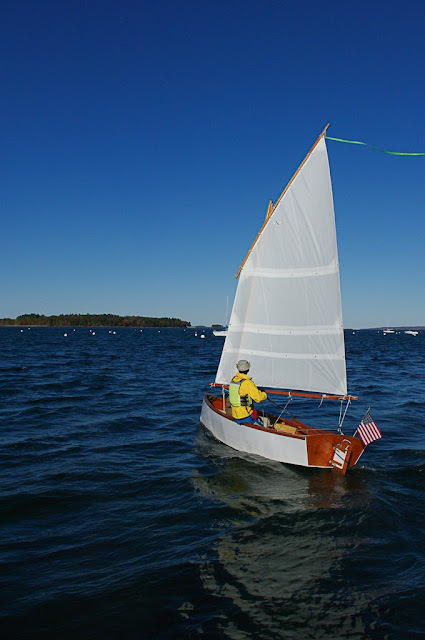 All the pictures below can be seen or accessed through this thread at the Wooden Boat Forum. There are pictures of other boats too, dories, a Pea Pod, and the like. I took several people for rides, all of whom I think enjoyed it. I am always happy to share my boat, sailing is awesome, sailing with others is even better! Many thanks to Jonathan, Gareth, Milo, Dan, Shane, and Clint for cruising with me this afternoon. You'll notice that I stand a lot sailing this boat. There is a reason for it. First, the boat is very spacious in the cockpit and it's large floor is ideal for standing. Second, my ruptured discs in my back don't like it when I sit for long periods of time. With this configuration, I get back relief and get to go sailing! So awesome, and an unintended bonus of the design. The boat is very comfortable for sitting too, so it's kind of a shame. But sitting on the floor with legs propped on the opposite side as well as the gunwale is all very comfortable. With GISAmateur fan, Jon! Yes, I have a fan! 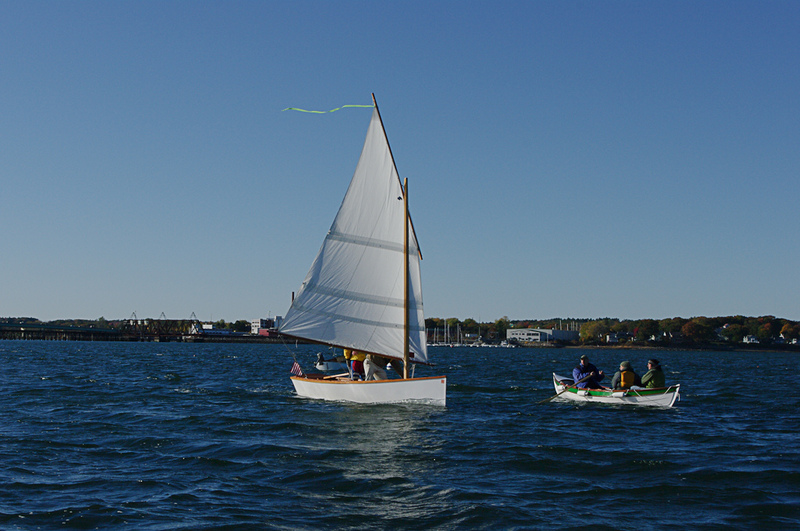 Tight Maneuvering around the dock makes for fun sailing! Heading out with Dan Noyes of Beachcomber-Alpha fame. I am humbled. 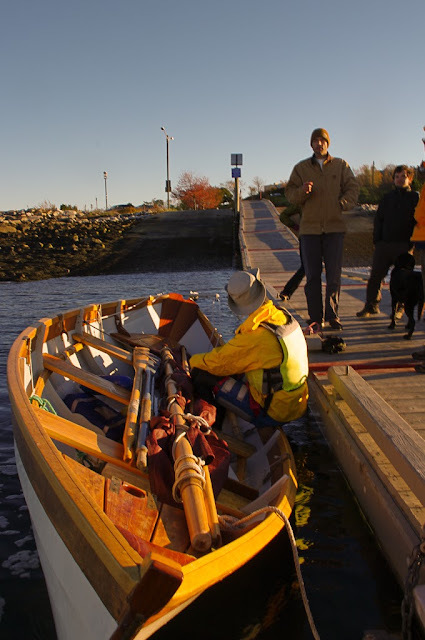 Clint Chase Boatbuilder holds court while I demonstrate the impressive stability of his Deblois Street Dory. VICTORY For I AM ZINEA, PTERODACTYLUS! So it was quite the season! 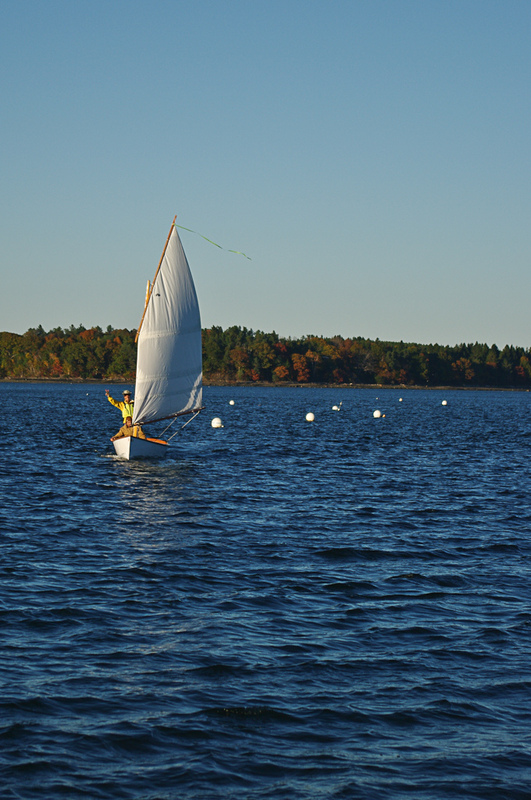 Some 30+ days of sailing, 8 of those were spent overnight cruising, several day-cruises to islands in Casco Bay and beyond, and lots of lake sailing in beautiful New Hampshire to boot! My back injury hampered certain adventures that were supposed to happen, but I had other adventures instead. It was a good season, and I am a happier man for it! 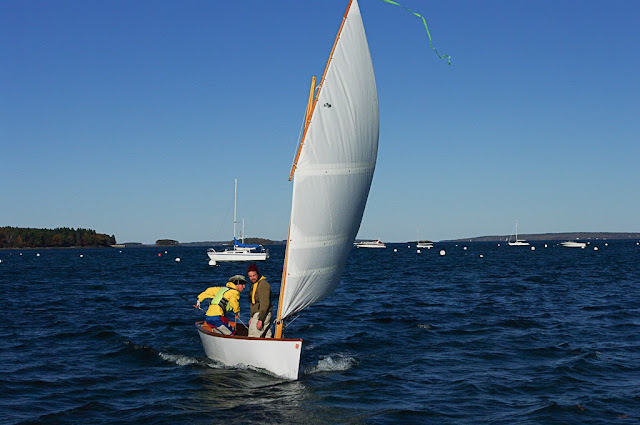 The intrepid reader will be advised to keep an eye on this blog, as I will soon be unveiling another Storer design, as well as addressing end-of-season mechanical issues with the Goat Island Skiff. There is a laundry list of repairs, cosmetics, and maybe even wholesale additions to the boat. The season is over, but the passion of boating is not! Thank you for your very thorough blog showing the construction of a GIS. You're welcome, thank you for visiting!